I don’t write about my music projects here on Musicwhore.org because that’s not the intent of the site. It’s all about other people’s music that I admire. But I have to say I’m really proud of the album I released at the end of March. It’s titled Travis, and most of the songs were written around the time I was preparing to leave Austin, emotionally if not physically. I actually finished recording it back in 2016, but I had other things I wanted to release before then. So I’ve had two years to live with the finished product, and it’s so far the best-sounding album I’ve recorded. Upgrading some components of my home studio to use a better class of software helped a lot. I also stretched my abilities as a self-taught audio engineer, relying slightly less on computers to make up for my faults as a musician. The album is up on Spotify, iTunes, Google Play and Amazon. 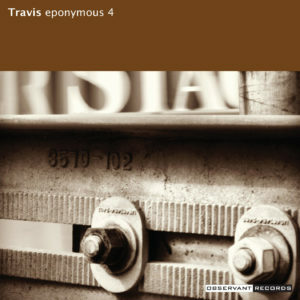 I also have CDs available for sale at the Eponymous 4 web shop. Next week, I’ll go back to talk about other people’s music.